The PuraFlame Western Embedded Electric Fireplace Insert is an energy-saving LED, beautiful and classic heater with slim remote control. To be very clear up front – this is an insert that fits into an existing fireplace. It is not stand alone or a wall mount. This is ideal if you don’t want to burn wood in your fireplace or have small children where safety is an issue. This would also make a great replacement for gas logs. It features 4 levels of flame with controllable variable intensity and brightness can be used with or without heat to set the ambience of any mood. Exceptional workmanship and precision detail make the PuraFlame Western a better buy than other similar products on the market. Downlight design increases the brightness of the hearth. PuraFlame has a three-sided wall design which looks like brick. There is high-precision workmanship of trim, welding and polishing which adds beauty as well as function. Electronic temperature control gives more precise temperature and makes your room more comfortable. The log and glowing embers set up to evoke realism. They set in place and not changeable so the foreground is as you see it. You do not have the ability to change the foreground media for special effects such as burning stones or gravel as in some electric fireplaces. For more comments see the pros and cons section. The heating capability of almost all electric fireplaces is somewhat limited. It is suggested that this heater will heat up a 400 ft.² room which is the same claim which many other manufacturers make and they often fall short. This one actually does the job and will provide supplemental heat to a small room; you to get nice and cozy by the fire. The heating levels are controlled by electronic temperature control which gives more precise temperature control makes your room more comfortable. This is a front heat discharge unit. The heat is distributed through the vent located in the front and near the top of the black glass enclosure in blows forward. The noise level is low. It is commonly described as a low background hum, not disturbing at all. Maximum heating area: 400 square feet. There are 2 levels of heat – high which draws 1500 watts of power and low which draws 750 watts. For the technically orientated, the firebox maximum heat output: 1500W (4600BTU). There is a set of controls located on the upper right of the unit hidden behind the vent up top. Of course there is also the remote control also. On the unit itself from left to right is the on/off switch (which must be in the on position for the remote to work). Next is the flame settings – 3 levels. Next is the heater high/low. and furthest to the right is the electronic thermostat. the controls are very straight forward. We think it is a nice touch that they are concealed. It keeps the aesthetics nice. On the remote in the top row, the flame level button is upper left, the power switch to the right The remaining 2 buttons are heater high and heater low. Yes, you can run the flame effects without the heater on. There are convenient handles on the side to lift and move it with so you don’t have to struggle with finding a hand hold. The electric cord is 5.9 feet long. There are covers available to help conceal it if needed. Operating the fireplace with just the flame effect should cost about 2 cents per hour. That is the cost calculated of LED bulbs. Therefore, using the flame effects mode and assuming 5 hours of use each and every night it would add about $2.00per month to your electric bill. If you operate in heat and flame mode it will cost about $.12 per hour. So, running the unit every night for 5 hours @ rated max of 1500 Watts would add about $28.20 to your electric bill. The 3 variables that will greatly affect your actual cost are how long you run the unit each month, your heat setting, and the cost of electricity in your state. Here is an accessory that will enhance your enjoyment of your fireplace. It will produce realistic crackling fire sounds.. 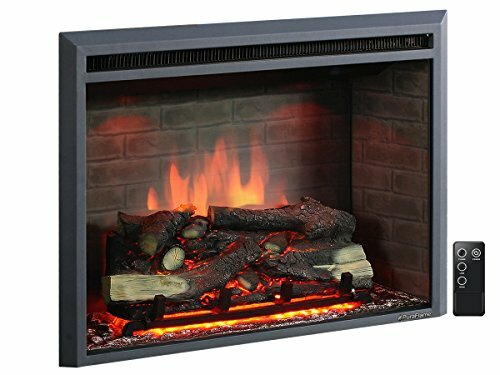 The reviews for the PuraFlame Western 33 inch Embedded Electric Firebox Heater at Amazon.com have been very positive and it currently has a review rating of 4.8 stars. Below are the pros and cons gathered from the reviews of product owners. As we mentioned, the majority of the customer feedback for the PuraFlame Western 33 inch Embedded Electric Firebox Heater has been very positive and 86% of the reviewers have given the product a 5-star rating. If you are looking for Electric fireplace pros and cons in general – CLICK HERE. There were so many areas where this Firebox Heater met its customers’ needs, it’s not easy to pick a starting point. The vast majority of reviewers stated that this product was well worth the price that they paid for it. Some even thought that it was more than a reasonable purchase. Some reviewers stated that it was cheap, and they expected to receive a cheap product- but didn’t. Buyers really liked that the firebox was well-made and looked like a real fireplace. They commented on the flame that did not look like the old-fashioned fake logs, but rather, that the fireplace appeared to be burning real wood when turned on, and looked like real logs ready to burn when turned off. Another great feature to the PuraFlame was the optional heater, allowing customers to gently heat the room when they wanted to, or just enjoy the show when they didn’t want extra heat. It didn’t escape the buyers’ notice that the controls are cleverly hidden- many commented on that being one of the added amenities, along with the remote control. Customers mentioned that the insert was easy to install as well as operate. It was thumbs up all around on this product. we think you’ll enjoy reading the reviews on this one. The majority of the customer feedback for the PuraFlame Western 33 inch Embedded Electric Firebox Heater has been very positive. In fact, we were quite surprised by the reviews that we read about the Firebox insert. We searched through a wide variety of online sites that sell this model of Firebox Heater and were unable to find a single negative review about it. In fact, we were not even able to find a neutral review. We felt certain that there must be a dissatisfied customer somewhere out there, so we took our problem to the search engine and tried desperately to find a negative comment about the PuraFlame, to balance out our review on the product. After spending a reasonable amount of time looking, we concluded that this was a product that exceeded customer satisfaction in every regard. We have never come across a product before that did not upset one or two customers along the way. This product is the first, in that regard. Would we recommend the PuraFlame Western 33 inch Embedded Electric Firebox Heater to our readers? The PuraFlame Western 33 inch Embedded Electric Firebox Heater was a super-hit with buyers. We can hardly believe that there were no negative reviews left for this product. 100% of buyers left a 4 or 5 star rating for the PuraFlame, and left a lot of reasons for prospective buyers to purchase the product. This is superior to the Dimplex fireplace insert previously reviewed. From its completely realistic-looking flame to the optional heat feature, the PuraFlame left customers feeling like they really got something for their money. In fact, when we researched this product elsewhere, it was selling for a lot more than the price that buyers paid on Amazon. We hope you enjoyed our PuraFlame Western 33 inch Embedded Electric Fireplace Review. Well if you post this i will leave you a neutral review. While it is well built and quite attractive compared to other electeic models it only has high, low, and off flame intensity and high, low heat adjustments. You do have a rheostat to control output on the front panel. The neutral aspect is installation in a regular fireplace. There is no mounting tabs whatsoever or hardware included. And beware if you screw anything into the housing you will ruin the pretty decor inside. So do you frame in your fireplce and shove it in hoping it dont fall out flat on its face? Yep thats exactly whag you do and hope small children dont pull on it. So unless you are building a fresh opening you can make so snug it is a hard push in you are going to have installation issues to contend with reconfiguring your exisiting fireplace. We had to remove much of our stone brick and reframe around it and sheetrock our entire fireplace in to use this and with the flange style front you are dedicated to its trim only meaning if it ever fails and you cannot find a different size ghen whatever wall decor you have and feaming must also be changed. Get a professional and consider the cons before you buy. Something with a install flange and no built in trim is ideal and will save future headache. Enjoy! Sorry you had trouble with the install. Fireplace inserts really leave the installation up to you. That is why we provided extremely detailed measurements and photos detailing length width and showing the flange. Istallation can be simple or complex depending on existing fireplace size, shape and dimensions and how close a fit the insert is. I’m interested in purchasing this fireplace however, I hesitate because it will not be installed in an existing fireplace. We want to build a cabinet and install it there. I’m concerned because of fire hazard. Can you tell me if this unit would be safe for this type of installation. If not, could you maybe point me in the right direction…the unit must have fan forced air. many people build it into furniture – that is the way they make electric fireplace stands. Can you help me with locating replacement parts?